Most of the temples and other such religious places in India traditionally have Oracles who are considered to be representatives of the gods. (See the pictures http://farm4.static.flickr.com/3235/2396067808_2e3cc10f71.jpg and http://www.wiki.indianfolklore.org/images/thumb/3/3a/NilaMarch2009_195.jpg/250px-NilaMarch2009_195.jpg ) I can vividly remember, as a child watching them with fear and awe as they would dance in trance. 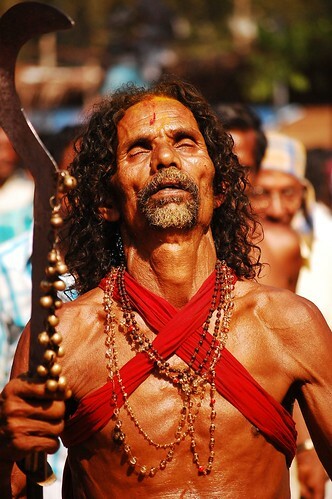 The oracles participate in special rituals in the temples in their special costume ( red dress, anklets, bells, sword) accompanied by drums. The ritual normally consists of some kind of dance, walking barefoot on fire and wounding themselves on the forehead with the swords. As the rhythm of the drums progresses, they enter in to a trance and what they talk in that state is supposed to be coming from the gods. Even today, these oracles command lot of respect in the villages. It was only after the incident described below, did I realize the brilliance of this whole thing. Anything that typically comes from the human mind is conditioned and limited by the logic. A true revelation or insight comes from a dimension beyond the logic. But for this to come, the logical mind need to be silenced, which is extremely difficult. But then the ancient people have invented lots of methods by which the logical mind can be temporarily gotten out of the way and in that gap an unconditioned thought can arise. One such method is ‘pain’. When you can consciously endure pain, it brings the mind to the present moment, which means the mind stops, which means suddenly you enter the realm of unconditioned space. This is what happens here. The Oracles walk on fire and wound themselves and when they do this consciously, they come to the present moment. The other paraphernalia and the drums just set the atmosphere for this. And once they are completely drawn to the present moment, what they say comes from beyond and has a quality that’s beyond the logical human mind. This entry was posted in Culture, Mind, Mindfulness, Thinking, Uncategorized and tagged Awareness, Conditioning, Logical mind, Mind, Mindfulness, Oracles, presence, Trance on May 28, 2010 by Sajeev. The comment from Yogi brought to my mind an incident that happened few months back. It may be interesting for those who are trying to cultivate ‘mindfulness’. Many a times we aren’t aware of what lies in there for us. I had been practicing ‘mindfulness’ to some extend and developed a liking for it. Sometime later, I decided to go deeper and experience what it means to live completely in the ‘present moment’. I started becoming aware of my body, thoughts, movements and activities, emotions, things around, how the mind is reacting etc. And in few days, I was almost living in present moment (or at least that’s what it looked like). Mind was very clear and there were hardly any thoughts. I could more clearly see how the mind operates. But this also had some adverse effects. One area that was severely affected was my memory. I started misplacing things and even lost a few of them. Even if I met someone and talked something, I did not recollect it later. And what is worst, even when I came to know that I had lost something, there was no feeling, no sense of loss. Work was another area that was affected, because the typical motivation factors like ‘proving’, appreciation etc did not have a place in the ‘present moment’. But, it was a very creative state. There were lot of insights. This particular incident happened on a Saturday. I was intensely in the present the whole day. Mind was almost blank. In the evening I went to a mediation session (I attend a weekly meditation session called the Sudarshana Kriya taught by The Art Of Living).This usually has an immediate and profound effect on the mind. On that day, after the Sudarshana Kriya, I became even more present. I was blank, no thoughts in the mind, but I was perfectly aware of everything around. I didn’t want to move and felt like being in that state forever. After we finished the session we sat there as the Teacher was talking to us. She observed that many people weren’t coming regular and she asked if any of us could suggest something to motivate them. All of a sudden I got up, walked up to her, took the mike and started talking. It was as if someone was making me do this, It seemed as if I had no control ( I would have never done such a thing in my normal state of mind) I talked about being in knowledge etc and the words did not come from me, it was as if they came from somewhere through me. It was few minutes later that I realized what was happening and came to my normal state of mind. I did manage to cover it up somehow, I guess. It was a profound experience that altered my whole understanding about myself. Later I stopped practicing mindfulness so intensely; I chose just to be aware. But when I looked back I think I was fortunate to have done it there; what would have happened if I walked up the CEO and told him he was not doing a good job? This entry was posted in Mind, Mindfulness, Thinking, Uncategorized and tagged Awareness, Creativity, Intense state of presence, Living in the present moment, Mindfulness, presence, Present Moment on May 11, 2010 by Sajeev. In the previous post I have said that a ‘creative thought’ (if I can call it a thought..) is one that is not influenced by the past. It has no continuity from the past events and does not bear a cause-effect relationship with anything. I stick to it, but thinking further, this is only one side of it. A ‘creative thought’ is also not influenced by the future. This means that it does not have a result beyond it or does not lead to something else. This is to say that the element of time cease to exist because all the continuity exists only linearly. One is taken out of the dimension of time (may be briefly) and in the new dimension of space that emerges, flowers a new thought. Also, this thought is not influenced (or conditioned) either by what it belongs to nor what it contains. And the thought itself is not influenced by its own past and future. In other words the ‘creative thought’ does not evolve or transform. It simply exists. Rather it chooses to. Its identity is not derived from anything that is there or that will be there. One can’t know it, it is beyond the logical mind to relate to.. This entry was posted in Creativity, Mind, Thinking, Uncategorized and tagged Creative thinking, Creativity, Dimensions in the mind, Mind, Thinking, Time and Space on May 8, 2010 by Sajeev.